The King's Creek hike is one of the most popular in Lassen National Park in Northern California. I've done it a couple times before in the Park and always took the Cascade Trail to the falls, but never made it because the trail became impassable at some point. The last time I was there it was closed so I took the Horse Trail and got all the way to the Falls. Absolutely a gorgeous place in the least visited of our National Parks! 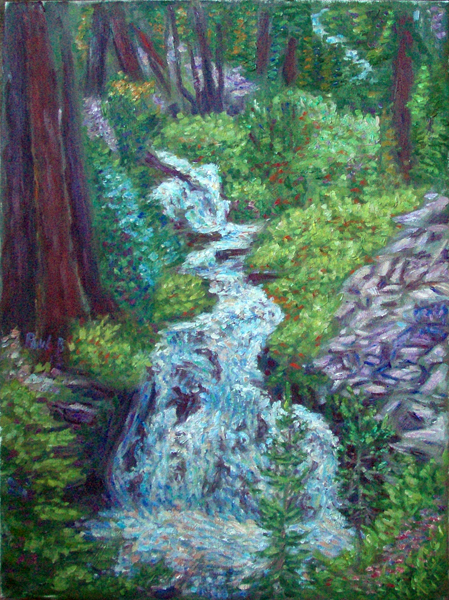 Notice the red accents in the yellow greens and the blue accents in the darker, bluer greens that sweep the viewer from the base of the falls through the center up to the creek coming down from the top of the canvas. I also like the play on blues and violets of different intensity in the water and rocks. PaulB's Pointillistic/Impressionist original oil paintings of National Park and various prints and poster formats of a wide variety of subject matter by the Pointillistic/Impressionist oil painter from landscape/waterscape paintings, dance, sports, portrait, to classical figures, flowers, rock and roll, Brazil, and National Park paintings and prints are available for purchase for as little as $24.95 for an 8" x 10" matted print on photo pape. Pointillistic/Impressionist Giclee prints of National Park on real canvas or heavy watercolor paper are available. One of a kind National Park embellished prints, which are Giclee prints retouched in genuine oil paint by PaulB. Unless noted PaulB's original Pointillistic/Impressionist oil paintiings are oil on canvas. Paul Berenson's pointillistic/Impressionist oil paintings are in privale collections around the world, including the downtown Los Angeles Athletic Club and have appeared in numerous publications, including the New York Philharmonic Playbill. PaulB.com also builds websites and PaulB is a member of the LA Web Professionals Group.